Today’s Class 1 was so much fun! We were happy to see the children back after the Entrance Ceremony yesterday. At first, some children were sad to come but during play time, we saw many smiles. The children enjoyed playing with new toys in new classroom. We learned about how to use the school toilets and everyone did so well. We had our first morning meeting, exercised with Classes 2 and 3, and then it was already time to go home. Today was short but fun! 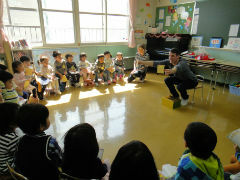 It is a great start and we are very impressed by each child’s good attitude. 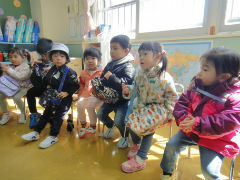 They seem to enjoy English and we will have lots of fun as they get used to Class 1. Thank you for the great day, everyone!